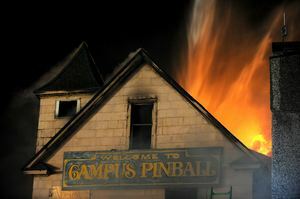 Posted on Thu, Dec 3, 2009 : 2:50 p.m.
Two homeless men are accused of deliberately setting fire to the old Pinball Pete's building near the University of Michigan campus in October, Ann Arbor police said. Justin Arens, 21, and Ian MacKenzie, 18, are charged with arson of personal property, preparation to burn and arson of real property, Det. Sgt. Brian Jatczak said this afternoon. "We haven't determined what the motive would be at this point," Jatczak said. Two homeless men were arrested in connection with the Pinball Pete's fire. The Oct. 24 blaze gutted the South University Avenue building. Investigators found traces of an accelerant, and Detective Dave Monroe said gasoline was believed to be used. Monroe declined to say what the men told investigators in interviews after their arrests. He said tips from the public helped identify the men as suspects. No one was injured, but the fire forced the evacuations of nearby buildings, including the high-rise University Towers. More than 600 U-M students were evacuated, and four apartments had heavy smoke and water damage. The building hadn't been occupied since 2001 and had become a haven for young loiterers and possibly squatters. Monroe said one of the suspects was known to stay in the vacant building on occasion. Arens was arrested Saturday after detectives spotted him on the street in Ann Arbor, Jatczak said. He is being held at Washtenaw County jail on $100,000 bond, jail officials said. Arens has prior convictions for second-degree home invasion in Washtenaw and Wayne counties. He was sentenced in both cases in 2007 to probation. MacKenzie turned himself in this morning at the police station, Jatczak said. He was arraigned this afternoon and is being held on $50,000 bond. Ann Arbor Fire Marshal Kathleen Chamberlain could not be reached for comment today. Both men will appear for preliminary hearings next Wednesday. Amalie Nash of AnnArbor.com contributed to this report. Lee Higgins covers crime and courts for AnnArbor.com. Reach him at (734) 623-2527 or email at leehiggins@annarbor.com. Wed, May 18, 2011 : 2:56 a.m.
i know ian and justin well. i was around when the police were asking everybody around about the fire. i still don't believe it was intentional. i see them as sweet guys, maybe a little dumb (at least their decisions, anyway) , but they had their hearts in the right place. my greatest hope is that they can persevere through all the trouble and hardship they face and get themselves to a better place once they are released. i know i'm not the only one who misses 'ninja'. good luck, guys. and to the people who favor pushing the homeless population out, i'm sure you'd feel differently if you lost everything and walked in their shoes. Fri, Dec 4, 2009 : 11:12 p.m. I'm really upset about this. I happen to know Justin and Ian personally, and they really are sweet guys. I am personally better friends with Ian, and I promise you he is a sweet kid, just trying to get by with what the world has thrown him. They both have dogs, whom I hope are in a safe place now. They love their friends and their dogs a lot more than themselves. They're sweet guys. I can understand why people judge the homeless, or people who make mistakes. But, when you get to know someone, and you see their character and the person they really are, you may think differently. I just hope people see that in them. zollar and racerx, I, too, have grown up in A2 for the last 40 years or so and, frankly, I don't notice much of a change in attitude. Sure, the City's grown and that often leads to a less "homey" feel but I don't remember any more or less compassion for homeless now than then. This community spends A LOT on helping the homeless (Delonis Center and private sources supported by locals) but that generosity tends to draw more people to use the services. It's a catch 22. How many of a2's homeless are actually FROM a2? Not a high percentage, I'll bet. Also, in the 60's through 80's the problem was hidden out at Mercywood and other hospitals. I don't think A2 has changed as much as the problem. recerx...conservative? The Peoples Republic of A2? Rediculous! Have you looked at City Council lately? Point out the conservatives! If you mean the citizens...I would say the Council refutes that rediculous assertion. Housing cost is a problem. Maybe the City should do a better job of encouraging larger, more verticle, more affordable buildings in downtown for housing. There's only so much space and it's a supply/demand issue. They ARE trying, I'll give them that. It's a tough problem. Fri, Dec 4, 2009 : 11:23 a.m.
As with the Michigan Inn the police are aware that these empty buildings are easily accessed and used by homeless. Could we ask for a twice weekly patrol of these building in the evenings and possibly get the owners to secure them from harm? Fri, Dec 4, 2009 : 10:24 a.m.
zollar, you've missed the point here...most people in A2, whether they are affluent or not for the most part are neither "not nice" or "nice" but rather feel they have entitlement...it's the socialist way...I deal with the homeless a great deal of the time, living downtown, as well as the non-homeless. Both groups are equally at ease urinating in public. I've had homeless trying to break into my car and the "affluent &amp; blue collar" people equally parking in my private reserved parking spot. I've had homeless people spit on me for not giving them a smoke, and my car keyed for towing "affluent and blue collar" people too lazy to park a half a block to a structure...yes, A2 has changed and it's not for the better in many ways. There are some people that need help in these tough times, and then there is the criminal element labeled as "homeless"...a criminal is a criminal first and foremost...if that person has no place to live then that person is homeless as well. Fri, Dec 4, 2009 : 9:29 a.m.
Looks like they will have a warm place for this winter, oh yea, free food too. Fri, Dec 4, 2009 : 3:56 a.m.
zollar-I agree. Having moved here in the 60's from another big midwestern city, the fabric of A2 has changed over the years, and to some extent, "yuppieism" (yea, I know its not a word, maybe an attitude! )can be blamed. The harmony and community feel of A2 is lost. Word got around of how A2 used to be and people from other areas began to moved here. Granted they're free to do so but it just isn't the same. Sadly, it has become more conservative than liberal. To the story though, if this property has been vacant since 2001, why wasn't the owner taken to court to "seal" the building or sell it like the Michigan Inn on Jackson Rd. was? It too had been a nuisance and eyesore where young people would enter and do whatever. Mmm...seems like a double standard here city of A2 leaders. Unless I'm missing some context of these two situations, here something actually happend while the Michigan Inn had the potential. Wonder if Pete's property taxes were paid to date! Thu, Dec 3, 2009 : 9:33 p.m.
Ms A2 girl, I have spent decades observing interactions of people on the streets of A2. ( My professional job gave me the opportunity to do so)And I stand by my statement from personal observation.I do appreciate the concern and interest your family and friends have shown to the less fortunate citizens of our community. Thu, Dec 3, 2009 : 7:41 p.m.
Justin Arens, 21, currently on Probation for Home Invasion - 2nd Degree in Washtenaw County, docket 07377-FH, was on in Wayne County also for Home Invasion - 2nd Degree after being discharged without improvement from Probation on 8/19/09. MDOC 642199 http://www.state.mi.us/mdoc/asp/otis2profile.asp?mdocNumber=642199 He also went through 'bootcamp'. Thu, Dec 3, 2009 : 7:35 p.m.
"More than 600 U-M students were evacuated, and four apartments had heavy smoke and water damage" Boy, if I were one of those 600 victims of their "gasoline" based fire I sure would consider that I was 'hurt' by their alleged actions. Thu, Dec 3, 2009 : 5:48 p.m.
to "Zollar", it sure sounds like you are saying that all affluent (and this is a very broad term) people are "not nice". you can be assured that there are plenty of lower income people that are also not nice, just as there are plenty of affluent people (in ann arbor) who are not just "nice", but who work hard to provide for those who are homeless or in need. i too, was born and raised in ann arbor. while I am not rich, i am comfortable, and i would probably be considered affluent by someone who is homeless. my family and friends are all very concerned and interested in the lives of ann arbor residents who are in need. i, and the people who i associate with, want to and try to bring comfort and compassion to those people. please be careful of making broad, generalized statements like that. it just adds negativity to an issue that deserves thoughtful attention and action. the last thing we need is someone making stereotypical statements about ANYONE, rich or poor. it's simply not productive. Thu, Dec 3, 2009 : 5:33 p.m.
What happened to the good old days, when vagrancy used to be a crime? Thu, Dec 3, 2009 : 5:06 p.m.
zollar, I'm with you. Ann Arbor has changed, and not for the better in many respects. Thu, Dec 3, 2009 : 4:18 p.m. Unless it was an accident as ezbngreen suggested, could these two have been trying to cover something up? Thu, Dec 3, 2009 : 3:25 p.m. Guess they aren't homeless now. Thu, Dec 3, 2009 : 3:20 p.m.
Thu, Dec 3, 2009 : 3:11 p.m. I've lived in Ann Arbor for over 30 years...And as far as I'm concerned the homeless are a part of Ann Arbor. If you dont like it, maybe a "one way bus ticket might be the best policy" for you...You dont buy a house next to the airport, and then complain about the noise. Just as you dont move to A2, and then complain about the homeless. Thu, Dec 3, 2009 : 3:06 p.m.
Yeah, load all those grungy arsonists on a bus and send them to Detroit... that's EXACTLY what we should do. My god. Next time, read what you've written before commenting, please. Thu, Dec 3, 2009 : 3:05 p.m. I am sure there is a good explanation for all of this; They were cold so they set a fire to warm up by. The shelter was too far away for them to make it there without freezing. Lastly the judge saw that these were two misunderstood youths that just needed a little supervision. How insensitive of us to think that they could act like the majority of law abiding citizens. Please give them another twenty or so chances before any punishment is handed down. Thu, Dec 3, 2009 : 2:35 p.m.
"Sounds like homeless people are not the kind of people that Ann Arbor should be trying to keep."!? What an insensitive comment. And where exactly would you suggest we bus them to? People like you, with an apparent complete lack of compassion, are part of what's wrong with society. Thu, Dec 3, 2009 : 2:24 p.m. They probably just made a mistake. I am sure they are good kids and are a product of their environment. Thu, Dec 3, 2009 : 2:21 p.m.
xmo: your compassion for other humans is moving. Not all homeless people set buildings on fire. There are valid reasons for some to need the shelters- maybe they're experiencing "tough times". Thank goodness nobody was injured- this could have been so much worse. Thu, Dec 3, 2009 : 1:57 p.m.
"Arens has prior convictions for second-degree home invasion in Washtenaw and Wayne counties. He was sentenced in both cases in 2007 to probation." Nice. Thanks for nothing, judges. Thu, Dec 3, 2009 : 1:52 p.m.
"Two homeless men are accused of deliberately setting fire" Sounds like homeless people are not the kind of people that Ann Arbor should be trying to keep. Maybe we do not need all of the shelters etc,a one way bus ticket might be the best policy. Just food for thought in these tough times.